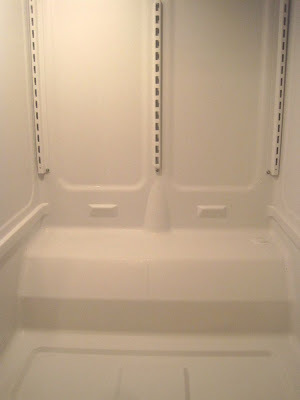 Is it possible to deep clean the fridge in under an hour? That alone sounds crazy, but then I get really nuts and attempt to deep clean the fridge in 20 minutes. If you ask me about the last time I cleaned my fridge out entirely, I would have to ask when we moved in. I spot clean now and then when I see something dripping. I am ashamed to admit I'm such a slouch at fridge cleaning, but these casual touch ups are becoming less and less effectual in the face of mounting gunk and grime. I love the stunning brilliance of a perfectly cleaned and organized fridge. Like a 1950s stereotype, I actually feel more refreshed and calm when my fridge is in order. But I have zero desire to be the one who puts it in order. 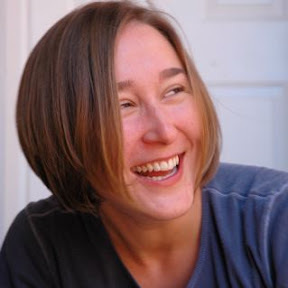 So when I saw Real Simple had a plan for a 20 minute speed clean of the fridge, I took a deep breath, and I plunged in. I set the timer for twenty minutes. One of those old timey timers with a really satisfying buzz at the end of it. Just thinking about the buzz evokes the adrenaline inducing nervousness of grade-school. Real Simple suggests that you spend minutes 1-2 unplugging the fridge and dusting off the coil with some special brush that I do not possess. 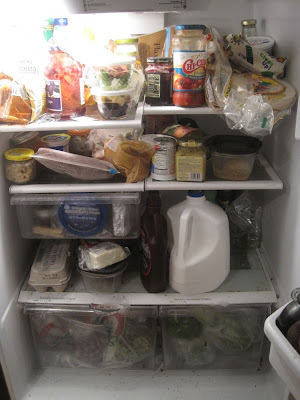 I spend some period of time staring at our fridge wondering if I can reasonably get it out of the tight recess into which it fits without dumping all the miscellaneous stuff on top of it. I decide against unplugging the fridge and believe the coils will survive. I reach inside to the thermostat and turn it off so I don't waste too much energy. Next I get about the business of removing the food from all the shelves and drawers. Real Simple suggests that I spend three minutes doing this. I briefly consider whether they are cleaning out a pint sized beer fridge, or are the sort of people who only keep creamer and stale bread in their fridge. My fridge is always packed to the seams with foodstuffs for the week and a menagerie of condiments and exotic ingredients. Kneeling in front of the fridge working as fast as I can with both hands I move the menagerie out of the fridge and it increasingly occupies a circle around me on the floor and stools. 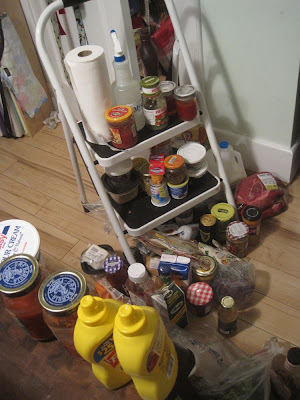 I uncover a couple of duplicates: two open jars of spaghetti sauce, two open containers of yellow mustard. Mental note to combine. Another thing that slows me down is that I'm checking expirations along the way and making choices about what needs to be tossed. How long has that hoison sauce been in there? How long do capers keep after opened? I'm thinning the herd, and it is work that needs to be done, but precious seconds are ticking by. The folks at Real Simple recommend that you remove drawers for washing in the sink. I've got two big produce drawers and one smaller one (ostensibly for lunch meat but ours is crammed full of exotic cheeses). Turns out I need to move the wine rack to get the door open far enough to get the second big drawer out of the fridge, so more time gets wasted there. I enlist the husband to soap up the drawers while I turn back to the fridge. At this point I'm cheating a bit because it isn't a solo job, now there are two of us working on it. It occurs to me that RS does not promise this is done by one person and for all I know they have a fleet working with them. I glance at the timer and realize that more than half our time has gone by already and I choke a bit. Real Simple suggests spraying the shelves with a multi-purpose spray and then just wiping them down. I stare forlorn at the gunk on the shelves and realize I will be scrubbing till Kingdom Come if I don't get them out and under the influence of some hot water. So all the shelves come out too and get passed to the husband. At this point, our toddler with the double ear infection wakes up and starts crying. Because unlike magazine pages, life happens even while you are cleaning. The husband goes "off the clock" to comfort the kiddo, and I assume his post at the sink, working my way through the pile of shelves at top speed. I have a shelf in my hand, with the fridge door unloaded and none of the walls or bottom wiped when the timer goes off. Oof. I start the stopwatch on my watch to track how far over the 20 minutes we go and then I finish the removed shelves, set them in the drain to dry and head back to the fridge. The bottom takes a lot of scrubbing, because the "trickle down economics" of fridge life means that everything that goes wrong winds up as gunk stuck somewhere in the bottom. I discover something suspiciously like honey (but can't possibly be honey because we don't keep it in the fridge) that is remarkably durable and resistant to cleaning. I briefly consider whether I, like the early pioneer of penicillin, have accidentally created the next super glue. I am using a multi-purpose cleaner that is non-toxic and homemade at an earth-friendly cleaning products class I took that day (from Megan of ProUtilitas Blog and ProUtilitas Etsy). So I am feeling very virtuous, and relieved not to have to worry about having my head in a cloud of toxins, because I'm spending a LOT of time in this fridge. It also smells delightfully of lavender and lemongrass. The mostly dry shelves get sprayed down with the homemade disinfectant and put back in. Now we remove everything from the doors and hubs washes the door containers while I wipe the door down. Now all that is left is to put the food back in, but we are already at an hour of cleaning time, and much of it with two people working. I realize it isn't the end of the world though. The promise of a 20 minute clean lured me in and helped me overcome the inertia of a dreaded task. And at the end of the hour plus cleaning time, I realize the whole project wasn't so bad, because my husband is fun and working with him always makes things easier to handle. I think I was also motivated by the vague sports-like overtones, us working together to race the clock. At the end we sit down congratulating ourselves on tackling a big and dreaded task. We bask in the glory of that shiny clean fridge. And we tell ourselves that the 20 minute clean is probably something you can do if you don't keep a lot of food in your fridge and you clean it out weekly. Or if you have a staff of five working in finely coordinated precision, like German engineers. We agree to try again in a week to test our theory. Even so, I'm not holding out much hope. But if you manage to clean your fridge in 20 minutes let me know. @Joanna: The source for all this cleaning goodness is an amazing woman named Megan who just started a blog called ProUtilitas (http://proutilitas.blogspot.com/). She also has an etsy shop where she sells hand made natural stuff, like upcycled hand felted wool scrubbers. Just google proutilitas and you'll find it. As for the "recipes" I don't want to steal Megan's thunder, but the all purpose cleaner is just water, castille soap and essential oil. The disinfectant is water, vodka or witch hazel, red thyme extract (for antiviral), and essential oils. Good for you for cleaning that out so quickly and thoroughly. 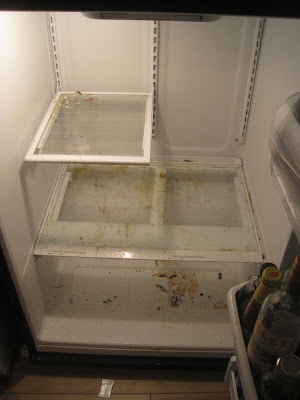 Last time I cleaned out my refrigerator, it was at least twice as dirty. You just don't notice those things over time and then it just hits you how dirty it is. I do my fridge in stages: I do my produce drawers periodically and then when we're out of milk, give that shelf a good wipe with hot water. I don't mind the crumbs in the door shelves as they're always covered up, and I try to get the main shelves when we're low on food. Meh, seems to work okay. Not unlike my rolling clean theory of Clean toilets today. Windows and mirrors in a few days. Vacuum on weekends. It takes me an hour to remove everything from my fridge and store it in coolers or across the tops of several counters. I may note that I have 3 teens in the house so our fridge is filled to the bursting point at most days. And my kids can still say with a straight face that "there isn't anything to eat in this house."